Below are listed the most amazing natural and man made landmarks of Northern Ireland. Marble Arch Caves – County Fermanagh. 11.5 km long cave system. Noon’s Hole – County Fermanagh. 3.5 km long cave system, starting with a 81 m high shaft. 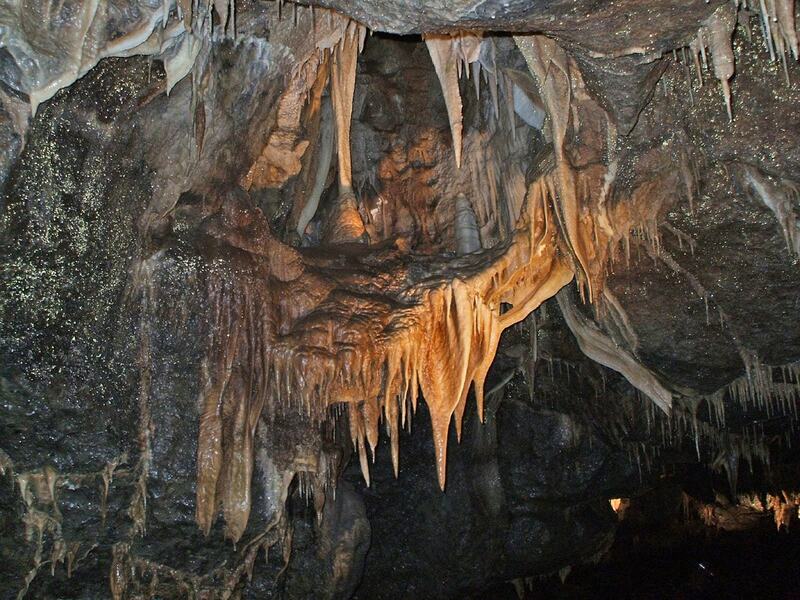 Shannon Cave – County Fermanagh. 5.4 km long cave system, most likely considerably longer. Burntollet Falls in Ness – County Derry. One of the most impressive waterfalls in Northern Ireland. Caledon Giant Sequoia – County Tyrone. Largest tree in Northern Ireland by mass – 48 m tall and with a girth of 7.53 m.
Cranny Falls – County Antrim. Tall, spectacular waterfall in ravine. Florencecourt Yew – County Fermanagh. Type specimen of the decorative variety of yew – Irish Yew. Found and replanted here in 1740. Giant’s Causeway – County Antrim. 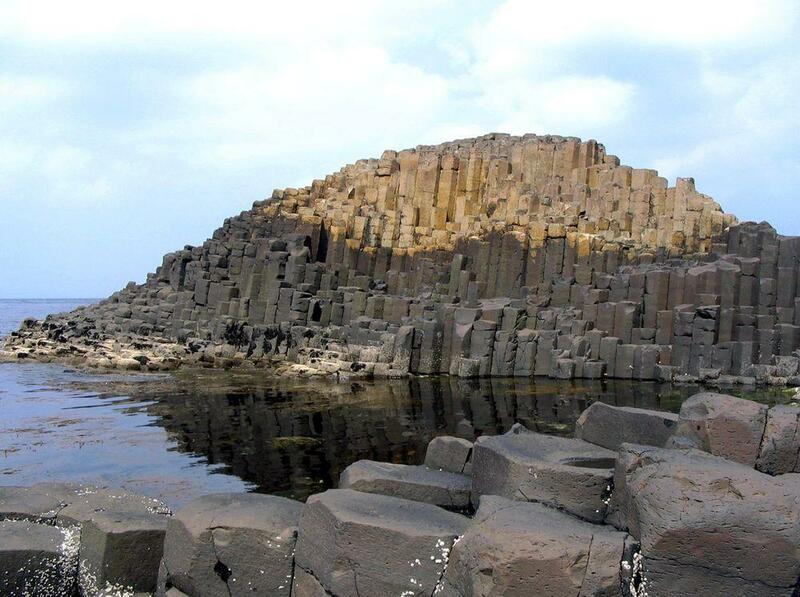 Area of outstanding natural beauty, with some 40,000 interlocking basalt columns. Tops of these columns form natural stepping stones leading into the sea. 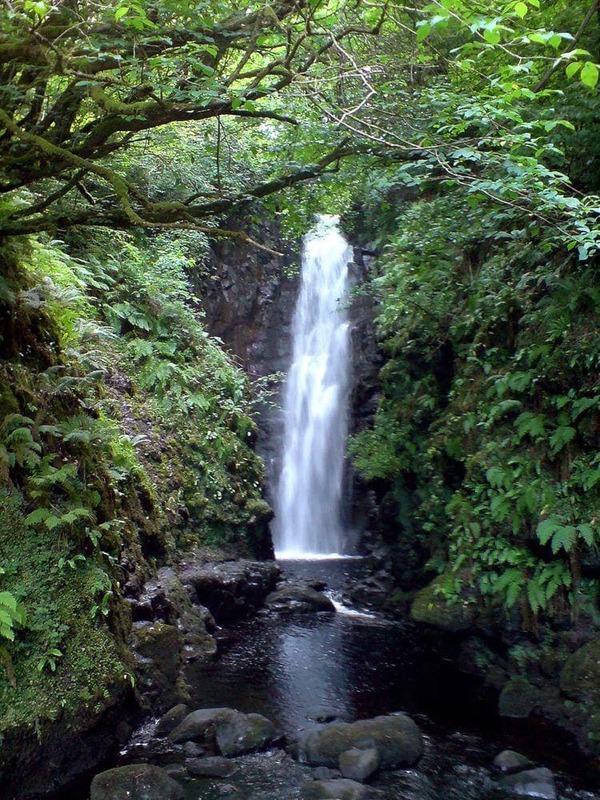 Glenariff Falls – County Antrim. Group of picturesque waterfalls. Great Arch near Portrush – County Antrim. Beautiful natural arch, formed by the sea wave action in white limestone. Audleystown Court Cairn – County Down. Megalithic court grave with a 27 m long passage flanked by standing stones. Ballylumford Dolmen – County Antrim. Dolmen, built roughly at 2000 BC, possible remnant of a passage grave. Craigs Dolmen – County Antrim. Remnant of a passage grave – enormous capstone placed on seven upright stones. Goward Dolmen – County Down. Large dolmen with capstone, which weighs some 50 tons, 4 m long. Now capstone has fallen on one side. Legananny Dolmen – County Down. Impressive tripod dolmen with capstone 1.8 m above the ground. Built sometimes around 3000 BC. Aughlish – County Derry. Site of interesting megalithic monuments – six stone circles and two stone rows. Ballynoe Stone Circle – County Down. Large, impressive stone circle with some 50 upright stones. Found cists with burials. Beaghmore megalithic monuments – County Tyrone. Group of Bronze Age megalithic structures. Found seven stone circles, 12 cairns, 10 stone rows, all together with more than 1000 stones. Corick megalithic monuments – County Derry. Group of megalithic monuments – some five stone circles and three stone rows. Drumskinny stone circle – County Fermanagh. Stone circle, built sometimes around 2000 BC. 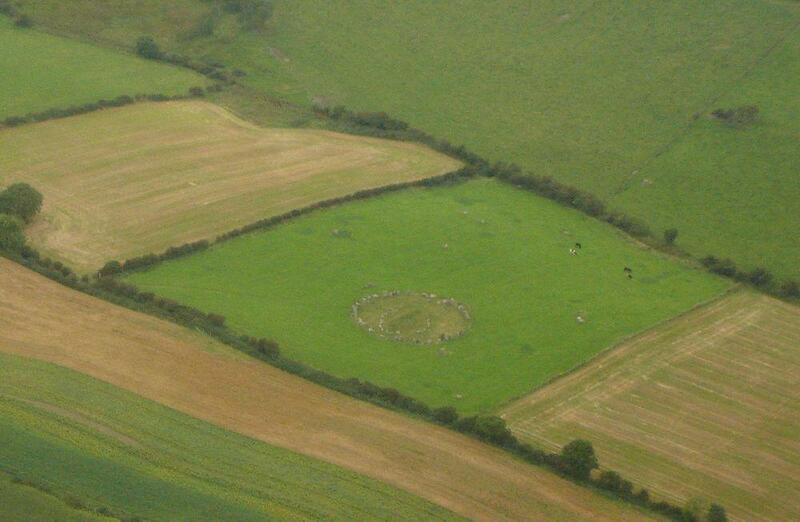 Giant’s Ring in Belfast – County Antrim. Henge – a circular enclosure, where the bank is up to 3.5 m high, diameter – 180 m. A megalithic passage grave inside. Ardboe High Cross – County Tyrone. Large, 5.6 m tall stone cross, erected sometimes in the 8th – 10th century. Adorned with 22 panels showing scenes from Bible. Bangor Abbey – County Down. Established in 558 and developed as center of knowledge, center of missionary trips to other areas of Northern Europe. Not active as abbey anymore. Boa Island stone statues – County Fermanagh. Two antropomorphic carved statues – one from Boa Island, one moved here from the nearby Lustymore Island. Possible pagan idols or early Christian creations. Devenish Island monastery – County Fermanagh. Interesting site of early Christian monastery. Contains 30 m tall Romanesque round tower from the 12th century and ruins from the 6th century. Knockmore cave art – County Fermanagh. More than 15 small caves. On the walls of these caves is art and writings from early Celtic and early Christian times. Ruins of Nendrum Monastery – County Down, Mahee Island. Remnants of early Medieval monastery, possibly as old as the 5th century AD and abandoned in the 10th – 12th century. Was enclosed behind three concentric stone walls. Sundial from 900 AD. 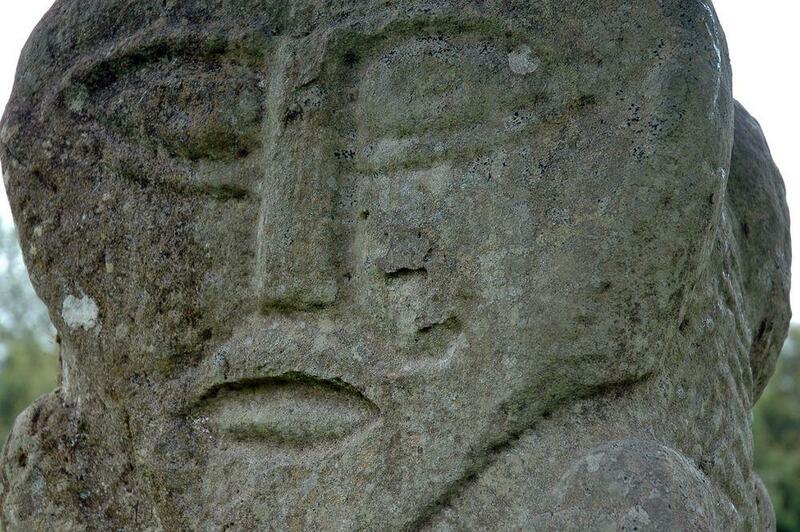 White Island stone carvings – County Fermanagh. Unique Medieval stone carvings in the ruins of Romanesque church, made sometimes around 800 – 1000 AD. Amazing representation of transition from pagan beliefs to Christianity. Black Pig’s Dyke – Defensive earthworks, stretching through several counties, also in Ireland. Built sometimes around 390 – 370 BC. Loughbrickland Crannóg – County Down. Bronze Age crannóg – artificial island settlement in lake. Struell Wells – County Down. Four holy wells, a sacred site since at least 3rd century AD. Covered with buildings – current structures are from the 17th century. Ballygally Castle – County Antrim. Fortified, massive country house built in 1625, reportedly one of the most haunted places in the province. 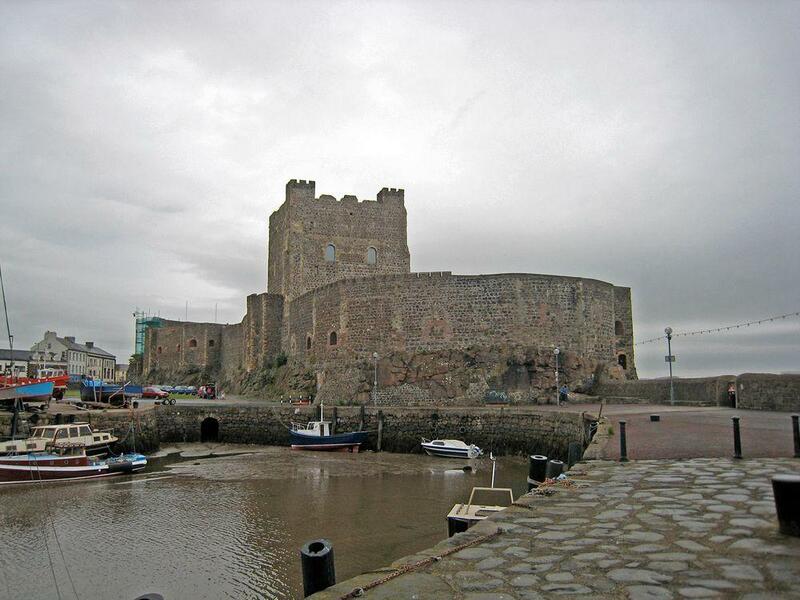 Carrickfergus Castle – County Antrim. One of the best preserved medieval structures in Ireland, built in 1177 by Normans, since 1210 – English castle. Castle has not been abandoned and as a result represents valuable monument of architecture and history. For most part surrounded by water. Castle Upton – County Antrim. Castle in the center of a village, with impressive tower house built in 1611. Killyleagh Castle – County Down. Oldest inhabited castle in Northern Ireland, parts of the present building constructed already in 1180. Redesigned in the 19th century. Bangor Castle – County Down. Beautiful country house, built in 1852 in Elizabethan – Jacobean Revival style. 35 bedrooms. 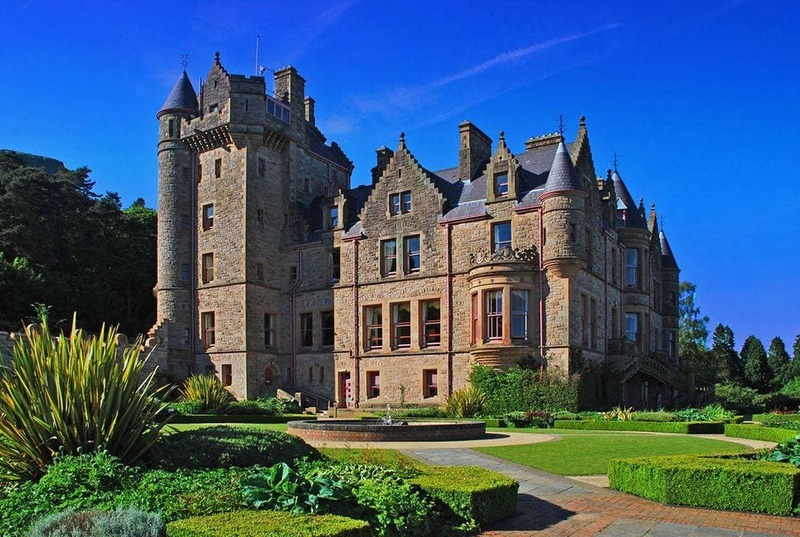 Belfast Castle – County Antrim. Massive stately home, built in Scottish Baronial style in 1862 – 1870 in a hill above Belfast. The building resembles a medieval castle. Castle Coole – County Fermanagh. Large Neo-Classical country house, built in 1789 – 1798. Crom Castle – County Fermanagh. Large country house, built in 1820 in Victorian style. Contains ruins of older castle. Drenagh – County Derry. Country house, built in 1835, with fine terraced garden. Florence Court – County Fermanagh. Large country house, built in the 18th century. Exquisite Rococo decoration of interiors. Glenarm Castle – County Antrim. Exquisite castle, built in the site of older castle in 1636 in Jacobean style, rebuilt in the late 18th century in Palladian style. Gosford Castle – County Armagh. Large country house, built in the rare Norman Revival style. Built in 1819 – 1850s. House has some 150 rooms. Killymoon Castle – County Tyrone. Beautiful Neo-Gothic country house, built in 1803 in the site of earlier building. Mount Stewart House – County Down. Country house from the 18th century, largely extended in the middle of the 19th century. Fine interiors and valuable paintings. Armagh St Patrick’s Cathedral – County Armagh. Historical church building. First Christian stone church was built here already in 445 AD and since then here have been built and destroyed 17 buildings. Current building is restored in 1834 – 1840. Down Cathedral – County Down. Ancient building. First time mentioned in written sources in 1124, when existing cathedral was repaired and enlarged. Since then it has been destroyed and rebuilt numerous times, nowadays oldest parts are from the 13th century. Contains medieval crosses. Saint Malachy’s Church – County Antrim, Belfast. Neo-Gothic church building, constructed in 1841 – 1844. Especially impressive are fan vaults on the ceiling. St Columb’s Cathedral – County Derry. Large church, built in late Gothic style in 1633. Castlewellan Peace maze – County Down. One of the largest hedge mazes in the world, arranged in 2000 – 2001. Mount Stewart Gardens – County Down. Some of the most beautiful gardens in United Kingdom, created mostly in the first half of 20th century. 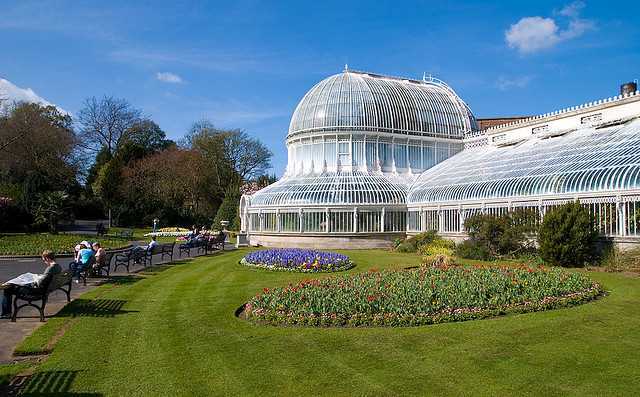 The Palm House of Belfast Botanic Gardens – County Antrim. One of the oldest curvilinear cast iron glasshouses in the world, built in 1840. Plant house contains many unique plants including 400 years old Xanthorrhoea from Australia. Albert Memorial Clock – County Antrim. Impressive, 34.4 m tall clock tower, built in 1869 in Neo-Gothic style. Tower is leaning. Helen’s Tower – County Down. Folly of medieval stone tower, built in 1861. It belongs to Clandeboye Estate. Mussenden Temple – County Derry. Small, circular temple building, built in 1785 to commemorate a deceased friend of estate owner. Impressive sight to the sea. Scrabo Tower – County Down. Tall tower on Neo-Gothic style, a memorial to local nobleman Charles Stewart. Tower was built in 1857. Austin’s Department Store in Derry – County Derry. Beautiful department store building, one of the oldest in the world. 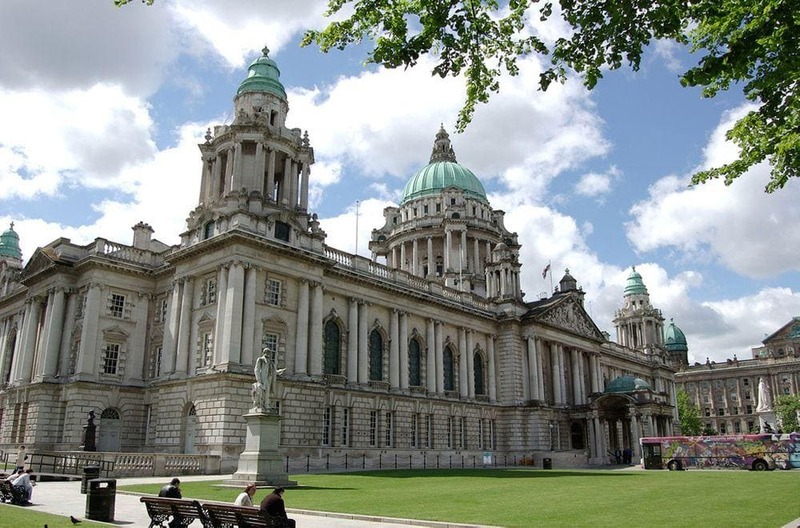 Belfast City Hall – County Antrim. Enormous Neo-Baroque civic building. Constructed in 1898 – 1906. Copper plated cupola in the center of the building is 53 m high. Adorned with numerous sculptural works. Belfast Grand Opera House – County Antrim. Beautiful theater house, built in 1895. Oriental style used in architecture. Craigmore Viaduct – County Armagh. Highest viaduct in Ireland, built in 1849 – 1852. This railway viaduct has 18 arches up to 38.4 m tall. Crown Liquor Saloon – County Antrim. Beautiful Victorian gin palace, refurbished in 1885. Very ornate interior. Derrymore House – County Armagh. Small, very elegant summer lodge, built in 1776 – 1787. Located in beautiful parkland. Derry Walled City – County Derry. The best preserved walled city in Ireland, the last walls built around the city in Western Europe (1613 – 1619). Walls are 1.5 km long, 4 – 12 m tall, whole city can be walked on walls. City has preserved its planning from the 17th century. Main building of Belfast Queen’s College – Coounty Antrim. Impressive Neo-Gothic structure, constructed in 1849. Merchant Hotel – County Antrim. Luxurious hotel building, constructed in the middle of the 19th century. Nendrum tide mill – County Down, Mahee Island. Remnants of the oldest known tide mill in the world. Dendrochronological analysis shows that it was built around 619 AD. Although one of the best known landmarks of Northern Ireland is the amazing Giant’s Causeway, there are numerous other amazing monuments. Early Christian monuments – remnants of ancient monasteries, churches and cemeteries contain unique values – such as stone sculptures combining pagan and Christian symbols. Megaliths – numerous stone circles and dolmens. Country houses – Northern Ireland is rich with diverse and magnificent country houses, including such amazing structure as Gosford Castle – unique example of Norman architecture style revival. Castles in Northern Ireland were built comparatively late and many country houses were fortified of were built similar to medieval castles. Thus there is not easy to draw a line between true medieval castles and country houses. In the case of Northern Ireland Wondermondo is using the traditional, historical division in 6 counties. In this compact guide, Rick Steves and Pat O’Connor offer their best travel tips on Northern Ireland, including Belfast, Portrush, the Antrim Coast, Derry, and County Donegal. Visit the Ulster Museum in Belfast, tour the Dunluce Castle or Giant’s Causeway along the Antrim Coast, or peruse Derry’s political murals. You’ll get firsthand advice on the best sights, eating, sleeping, and nightlife, and the maps and self-guided tours will ensure you make the most of your experience. This revised guide presents top-class walking routes in Northern Ireland. From rugged mountain peaks to spectacular coastal scenery, from challenging hill walks to shorter woodland and waterside excursions, there is something for everyone.